Plants sparsely to densely pubescent proximally, some-times glabrous distally. Stems (0.2-)0.5-3(-5) dm. Basal leaves: petiole 0.1-0.5 cm; blade oblanceolate, obovate, or oblong, 0.3-1.5(-2) cm × (1-)2-6(-8) mm, margins entire or dentate, apex acute to obtuse, surfaces uniformly pubescent, trichomes cruciform and 3-rayed, adaxially sometimes mixed with coarse, simple ones. Cauline leaves 1-6; blade similar and equaling or smaller than basal. Fruiting pedicels slender, (1.5-)2-4(-6) mm. Flowers: sepals 0.5-1 × 0.3-0.7 mm; petals oblong, 1.5-3 × 0.5-1 mm; filaments 0.4-0.6 mm; anthers (0.05-)0.1-0.2(-0.25) mm. Fruits usually orbicular to obovate, rarely broadly oblong, 1-locular, not twisted; valves thin, veins sometimes prominent, usually pubescent, rarely glabrous, trichomes simple, to 0.5 mm, hooked (sometimes restricted to margins, or mixed with smaller, sessile, cruciform or 3-rayed ones); septum absent; ovules 2(-4) per ovary; style 0.05-0.2 mm. Seeds 1, (0.8-)0.9-1.1(-1.2) × (0.5-)0.7-0.9(-1) mm. 2n = 26. Flowering Feb-Jun. Open grassy slopes, grassy glades in woodlands, chaparral, sandy and gravelly flats, flood plains, rock outcrops, cliffs and ledges, on limestone, serpentine, sandstone, granitic and basaltic substrates; 0-1800 m; B.C. ; Ariz., Calif., Idaho, Mont., Nev., Oreg., Wash.; Mexico (Baja California). Records of Athysanus pusillus for Montana appear to be solely from Ravalli County, and for Nevada from Storey and Washoe counties. Duration: Annual Nativity: Native Lifeform: Forb/Herb General: Small, herbaceous annual, erect or prostrate, 2-25 cm, pubescent to strigose, hairs simple or 2-5 branched, leafy, especially towards the base. Leaves: Basal leaves oblanceolate to oblong, to 10 mm, pubescent or strigose with coarse hairs, cauline leaves sessile, somewhat smaller than the basal leaves. Flowers: Pretty white flowers with minute oblong petals, borne in terminal racemes, racemes elongate, 1-sided, flowers bisexual with 4 sepals. Fruits: Flat, obovate to oblong capsule with white hairs forming a halo around the margins, hairs hooked, simple, or 3-rayed, surface pubescent with prominent veins, ovary with one locule. Ecology: Found on dry, sandy and gravelly soils, on serpentine, limestone, sandstone, granitic, and basaltic substrates in grasslands, floodplains, woodlands, and chaparral, from 0-6,000 ft (0-1829 m); flowers February-June. 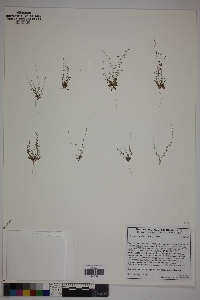 Distribution: Idaho to British Columbia, AZ and CA Notes: The hairs radiating from the margins of the flat pods are a good indicator for this species. Ethnobotany: Unknown Synonyms: Athysanus pusillus var. glabrior, Thysanocarpus oblongifolius, Thysanocarpus pusillus Editor: LCrumbacher, 2011 Etymology: Athysanus comes from the Greek a, "without," and thusanos, "fringe," and referring to the wingless fruit, while pusillus means small, weak or insignificant.